Cornwall’s north coast brings to mind quaint fishing villages, crab sandwiches and golden sands, but there is a darker side – one seeped in the murky history of shipwrecks, stormy seas and smuggling. Keen to expound upon the idea that Cornwall’s coast is much more than a one dimensional picture postcard, Cai Waggett of Hickory Nines fame has organised an art and photo exhibition titled The Cruel & Curious Sea. 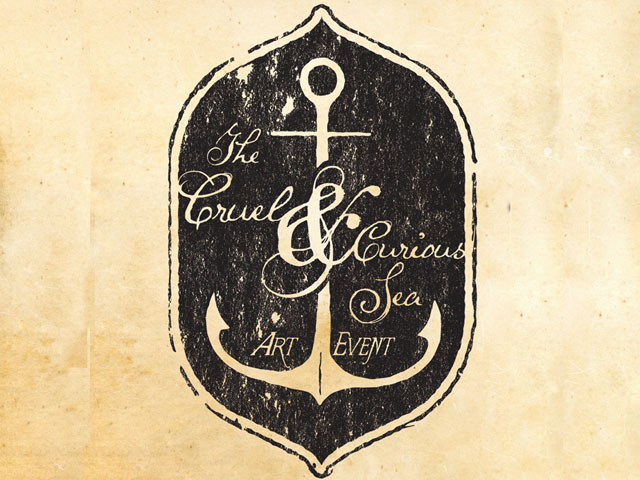 Over two evenings on the last weekend of September 2013, the historic North Cornish courtyard and barns of Stowe Barton will be the setting for up to 17 artists who will be exhibiting their take on the ‘Cruel & Curious Sea’. Waggett is an interesting chap with fingers in many pies. 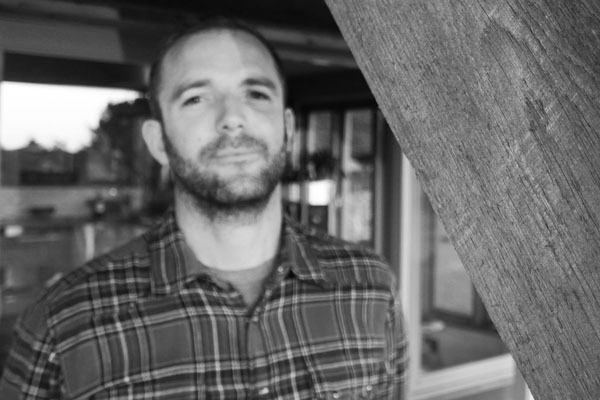 He is one of the organisers of Leopallooza – ‘the greatest house party in a field’ and has been curating the blog Hickory Nines since 2010. He also has deep-seated love of California but that’s another story. I caught up with the man himself to learn a little more about the artistic gathering he’s put together. CAI WAGGETT HAS CURATED THE CRUEL & CURIOUS SEA EXHIBITION. I think, originally, it’s all down to Derek Nobbs. He’s an artist from the Pacific Northwest that my friend Bob came across and thought I’d be into it. He’s a bit mysterious and I’m just hooked on his work. Lots of detail, full of dark portents and stuff – my kind of thing. I was also reading Colin Woodard’s ‘Republic of Pirates’ at the time too and drinking a bit of rum, so that helped. How did Hickory Nines relationship with the National Trust come about? I’ve known and surfed with Jeff Cherrington, (head ranger – North Cornwall) for years. I used to put on an annual surf contest up here with the National Trust, so we’ve worked together a few times before. We’d talked about doing something else, and when I suggested using Stowe Barton for an exhibition, Jeff was into it straight away as he’d already had it in mind to put more events on there. The barns are generally used for storage so it was a great opportunity for them to bring them back to life. The exhibition focuses on the ‘darker, disquieting’ aspects of the sea? Do you feel the sea is misrepresented broadly speaking? Well, I wouldn’t say misrepresented. I think a lot of people get it right, in the photos and art that you can find all along this coast. But I definitely feel that there is a side to it that is under-represented. I was brought up around here and I was told all the stories of Reverend Hawker, the wreckers, sightings of Mermaids and whatnot. I actually know people who’ve pillaged wrecks, and they’re still alive today! I’m not saying I believe in all the myths, but it’s such a rich seam of history and so in danger of being glossed over by all the super-saturated twee postcards you can buy in the towns along the coast. Of course they have their place but I feel there should be some more balance. There are a lot of lost stories in those coves and gullies and I feel like we should celebrate them somehow. ARTIST DANNI BRADFORD’S WORK WILL BE ON DISPLAY AT THE EXHIBITION. Who are the artists and photographers on show and do they all live in Cornwall? There’s a real exciting, eclectic bunch! And I should point out it’s not all going to be sinking ships and sea monsters… There’s a lot of contemporary stuff too, from surf photography to bespoke leather belts to octogenarian belly-boarders! It’s definitely a celebration of the curious as well as the cruel. Most of the exhibitors are from the South West but there are a few who are from further afield, and I’ve even had several requests to be involved from the States but logistically it’s tough. Speaking of which, there’s an artist from Colorado called John Fellows that everyone should check out – we talked about shipping over some pieces exclusively for the exhibition but costs were just too prohibitive. Shame. Is Stowe Barton really haunted? What’s next for Hickory Nines? The online shop! It’ll just be core stuff to begin with, tees and hoodies and such, but I’m in discussion with a couple of fantastic artists who are keen to do some t-shirt collaborations. There’s also a new full time contributor joining the ranks in the next few weeks. All coming soon! The Cruel and Curious Sea is in association with Finisterre & the Harbour Brewing Co, Hickory Nines and the National Trust. Last quarter the export market was worth £3,9bn in SW – this is an opportunity for all Cornwall artists to increase their customer base overseas. We may have to cancel this workshop if there is insufficient interest – it’s half full so far.